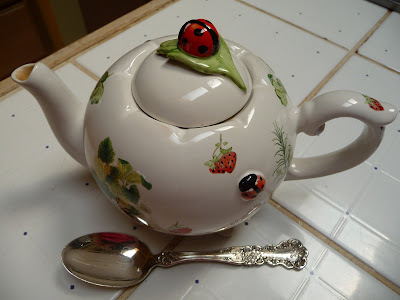 For a blog labeled "Teapots and Polkdots," there have been no teapots so far! Allow me to introduce you to mine. Above, on the left is Villeroy & Boch's "Petite Fleur." I fell in love with it at a lovely hotel in Scottsdale, Arizona. It was front and center at a memorable afternoon tea I enjoyed. As soon as I got home, I ordered the pot and have loved it for years. 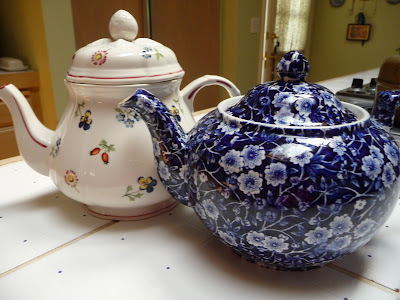 On the right is "Blue Calico," my oldest and best-loved teapot. I bought myself this one when was still in high school, so it's almost 40 years old. Even with a small chip in its spout, it's perfect. I adore it. Next up, on the left above, is a pot I bought at IKEA. 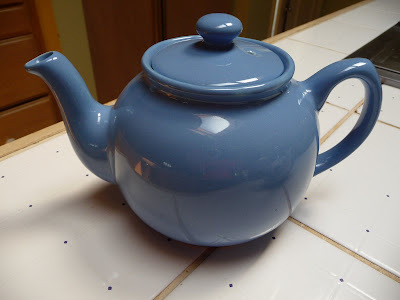 I call it my "Blue Betty," a joking reference to the British custom of brewing tea in an ugly-but-functional, often brown china pot, called the "Brown Betty." After the tea was brewed it was then poured into a prettier pot for serving. Blue Betty is taking a back seat in this photo to a pot I bought in the Czech Republic about five years ago. I'd hiked all over the country for a week and couldn't find a single thing I was dying to have as a souvenir, when I came across a little shop selling all manner of teapots, cups, bowls, and plates in this lovely pattern. I have no idea what the pattern is called, but on the bottom of the pot is printed "Original Bohemia," then the word "Zwiebelmuster," so maybe that's it. It's my newest pot, perhaps the most exotic one I own. Here's Blue Betty, getting its moment in the sun. This is my littlest teapot, just two cups' worth (teaspoon included for scale). It's perfect for when I want just a little bit of tea. (That doesn't happen very often!) Love the leaf-and-ladybug knob on the lid. I have no idea about this pot's manufacturer. A single tiny word, written in script, is on the bottom. Looks like it says "Klein" or "Khien"--anybody recognize that? I'm bonkers about this teapot, above. 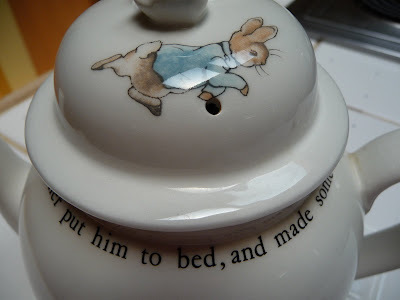 It's Wedgwood, decorated with words and illustrations from Beatrix Potter's beloved book "The Tale of Peter Rabbit." One of the cutest things about this pot is the text, reproduced in the same typeface as the book, that wraps around the pot just under the lid (see below). 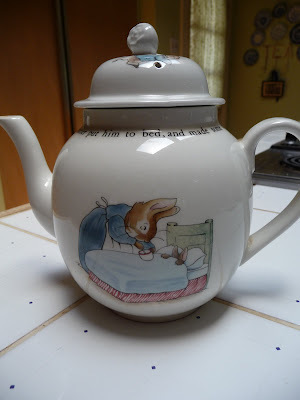 And it mentions Peter getting fed chamomile tea--a teapot quote on a teapot! What's not to love? 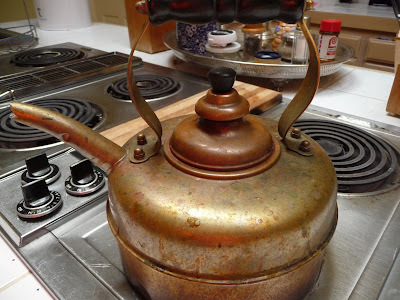 Last but not least, I must mention my wonderful workhorse of a copper teakettle (below). It rarely ever gets polished, so it's not much to look at. But I couldn't be without this sturdy citizen (and its piercing whistle, which summons me from the farthest part of the house when the water's aboil). So thank you, teakettle. And now I think I'll make myself a pot of tea! P.S. 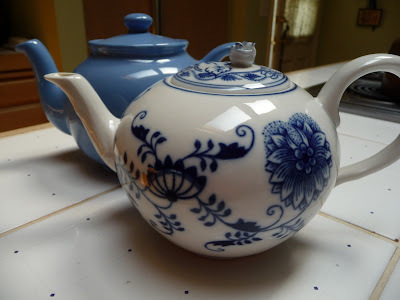 If you're looking to replace a broken or missing teapot, or any other sort of china for that matter, check out http://www.replacements.com/. Over the years I've used them to fill out my daily china when pieces got nicked or broken. And once my hubby used them to buy an entire Peter Rabbit teapot for me when I accidentally broke the lid to my dear PR pot.